Fritz's Polka Band--Welcome to the official web site of Fritz's Polka Band! This is the Official web site of Fritz's Polka Band, sponsored by Coldcock Whiskey!!! Sign our guest book (click on link at the bottom of this page), and join our mailing list, too. Contact FPB at: fpolkaband(at)aol.com. The members of FPB encourage you to check out our schedule and attend many of our gigs. Be sure to bring your friends, and plan on having a great time! Stop back to this site often, as updates take place quite frequently. Please visit us on Facebook, too and Twitter! 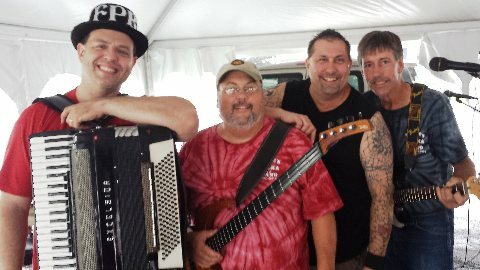 Fritz's Polka Band (FPB) was formed in 1978 by lead accordionist, the late Fred Scherz Sr., and his eight-year old son, Fritz, for whom the band was named. Sadly, Fred passed away on November 14, 2009, but FPB has vowed to carry on his legacy! Playing everything from modern-style polka to country to rock and even blues, FPB performs an eclectic mix of musical styles! Fritz's Polka Band is NOT an oompa pa band or the stereotypical "polka" band. In fact, FPB is known for breaking the stereotype regarding "polka" music. FPB is the first polka band to perform at a Woodstock Festival (Woodstock '99)! On October 7, 2010, FPB was inducted into the Syracuse Area Music Hall of Fame! Fritz's Polka Band has made 19 recordings, which have achieved international airplay. Individuals of the band, and the band itself, have received some prestigious honors. As a group, FPB has performed on stage with "Canada's Polka King," Walter Ostanek (Grammy winner), "America's Polka King," the late Frank Yankovic (Grammy winner), LynnMarie Rink (Grammy nominee), and Glen Burtnik. Individually, Fritz has performed on-stage with Steve Augeri (former lead singer of Journey) and Charles Giordano (current accordionist/keyboardist for Bruce Springsteen). FPB has performed at B.B. King's Club (2003), The China Club (2006), and The Metropolitan Club (2007) too! FPB even appears on "The Manchurian Candidate" DVD, released by Paramount Pictures in 2004! In 2011, FPB had two different songs appear in episodes of the hit cable TV show, 'Breaking Bad', which airs on AMC.